June 1, 2019 through June 4, 2019 Atlanta, GA Hyatt Regency The Annual Conference is a highly-anticipated event that brings together people from throughout our national network of nearly 950 programs. Joining us each year are also staff of direct service organizations, social workers, judges and members of the legal profession, corporate leaders, researchers, funders who are committed to our joint cause, and more. Keynote speakers who are leaders in their field will inspire you to take action on a certain issue. In workshops that follow each speech, you'll join with experts, colleagues, and people with lived experience in child welfare to discuss issues in detail and learn just which actions have been most effective in addressing them. Throughout the conference the common theme will be supporting children and their families--whether biological, kin or guardianship, foster or adoptive--with the understanding that the importance of family in a child's life cannot be overstated. This year’s conference will focus on building stronger families to achieve better outcomes for children. It's an opportunity for those committed to serving our most vulnerable children to learn more about: - supporting children and families involved in the child welfare system; - the role of reunification, kinship care, guardianship, foster placements and adoption; - achieving safe, permanent placement for children; - the importance of strong families in successful outcomes for children; - the issues facing children and families today; and - how the passage of the Family First Prevention Services Act—which allows federal funding to pay for services to prevent children’s removal from their families—intersects with CASA/GAL volunteers’ important work. 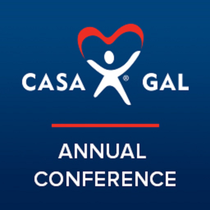 Attendees will also benefit from countless opportunities to meet with and learn from others who care as much about the CASA/GAL mission as they do. There is no “I” in team: A panel discussion about multi-disciplinary approaches to working with child trafficking. HON. PATRICIA “PAT” BRESEE (RET.) is a retired Superior Court Commissioner, assigned to sit as a Juvenile Court Judge. Pat Bresee is a recognized expert in Juvenile Law and has been honored as Juvenile Court Judge of the Year by the California Judges Association and as Judge of the Year by the National Court Appointed Special Advocates Association (NCASA. )She served two terms on the San Mateo County First Five Commission and currently serves on the San Mateo County Blue Ribbon Commission.In addition, she is a former member of the Board of California CASA, having served as chair for three years. While Chair of the Board of the Peninsula Community Foundation, she headed a committee to achieve a merger of that foundation with the Community Foundation of Silicon Valley to form the Silicon Valley Community Foundation and served as Chair of the new entity.Pat currently serves as Vice-Chair of National CASA’s Board of Trustees. As vice president of corporate social responsibility at Chick-fil-A, Inc., and executive director of the Chick-fil-A foundation, Rodney Bullard leads Chick-fil-A’s community engagement, philanthropic and sustainability strategy. His first book, Heroes Wanted: Why the World Needs You to Live Your Heart Out, contains inspiring stories to help readers demonstrate life-changing compassion, understand courage and make brave choices every day. Bullard, who previously served as an assistant U.S. attorney and a White House fellow, has received numerous awards for his service, including the Department of Justice Director’s Award, Duke Law Young Alumnus of the Year (2016), and the Most Admired Atlanta Non-Profit CEO (2017). He was named one of the 500 Most Influential Atlantans in 2018, and was granted the lifetime-honor of being named an "Outstanding Georgian" by the Georgia Senate (2019). Bullard is an alumnus of the Air Force Academy, Duke Law School, the University of Georgia’s Terry College of Business and Harvard Business School’s Advanced Management Program. His speech at the Awards of Excellence Gala—at which we will recognize CASA/GAL heroes nationwide—will describe surprisingly simple but powerful ways each of us can impact others and create a legacy of service. Patrice Comey, a member of National CASA’s board of trustees, is a former elementary school teacher and Peace Corps volunteer with a master’s degree in marriage and family therapy. She currently serves as a CASA volunteer in Fairfax, VA. Her service to children is also informed by her experience as a therapist and as a mother of five. James Comey led the Federal Bureau of Investigation from 2013 to 2017, after serving as the U.S. Deputy Attorney General and in other roles in the public and private sectors. He taught at Howard University as the King Endowed Chair in Public Policy, and is currently teaching a leadership course at his alma mater, the College of William and Mary. The Comeys served as licensed foster parents in Connecticut from 2011 to 2015. They are loving godparents to their first foster baby and still babysit him on a regular basis. In addition to sharing their experience as foster parents and with local CASA programs and National CASA, the Comeys will speak about the importance of service to others. New York Times best-selling author/illustrator Jarrett J. Krosoczka creates books with humor, heart, and a deep respect for his young readers—qualities that have made his titles perennial favorites on the bookshelves of homes, libraries, and bookstores. Titles include several picture books, his wildly popular Lunch Lady graphic novels, and the Platypus Police Squad middle-grade novels. He also recently launched a new story arc in the Jedi Academy series with Star Wars™: Jedi Academy: A New Class. His most recent book, Hey, Kiddo (Oct 2018), is a graphic memoir about growing up in a family grappling with addiction, and finding the art that helps you survive. Hey, Kiddo was a finalist for the 2018 National Book Award for Young People’s Literature. Krosoczka will share his experiences being raised by grandparents and dealing with addiction in his family. Mary Landrieu, a former member of National CASA’s Board of Trustees, started her career in public service in 1979, when she was elected to the Louisiana State Legislature at the age of 23—the youngest woman to ever be elected. For eight years, she successfully championed causes related to women and children, flood protection, and education reform. In 1987, she was elected State Treasurer, and served with distinction for two terms. In 1996, she became the first woman from Louisiana elected to serve a full term in the U.S. Senate. As a member of the Armed Services Committee, the Appropriations Committee, Chairman of the Small Business Committee, and Chairman of the Energy and Natural Resources Committee, she became known as a tireless advocate for her home state. She also helped establish, and co-chaired, the Congressional Coalition on Adoption, and is a founding member of the Congressional Coalition on Adoption Institute. Among Landrieu’s other notable accomplishments in the Senate were the passage of the Small Business Jobs Act of 2010, the landmark Gulf of Mexico Energy Security Act, the Israel American Energy Alliance, and the RESTORE Act—the single largest one-term environmental investment in the Gulf Coast in the history of the nation. Landrieu will share her experiences as an adoptive parent, and speak to the importance of adoption as an option for children who have experienced abuse or neglect. Bryan Stevenson is the founder and Executive Director of the Equal Justice Initiative and one of the most acclaimed and respected lawyers in the nation. His memoir, Just Mercy, is the story of a young lawyer fighting on the frontlines of a country in thrall to extreme punishments and careless justice. It is an inspiring story of unbreakable humanity in the most desperate circumstances, and a powerful indictment of our broken justice system and the twisted values that allow it to continue. Nobel Peace Laureate Desmond Tutu has called Stevenson America’s young Nelson Mandela.” His work on individual cases has generated national attention and his efforts have reversed death penalties for dozens of condemned prisoners. Stevenson’s remarkable twenty-minute TED Talks on the subject of injustice has been viewed over 2.35 million times on the TED website and another 299k times on YouTube; The New Yorker named it one of five essential TED Talks. Stevenson is the recipient of numerous awards, including the MacArthur Foundation “Genius” Grant and the NAACP Image Award for Best NonFiction, and was named one of Time’s 100 Most Influential People for 2015. Stevenson is a tenured law professor at New York University School of Law. His speech will illuminate the impact of mass incarceration and inter-generational incarceration and the impacts it has on children being served in foster care and families. Nearly 20% of children entering the child welfare system have incarcerated parent(s) and because close to 80% of individuals in prison were once in the child welfare system, the CASA/GAL organization has much to learn from his work as a justice activist and reformer that will address the needs of children and families in our care. Bringing a team? For every 5 registrations you get the 6th registration free. All registrations must be completed together before the payment is submitted. * Volunteer, Student/Youth and one-day only registrations are excluded. Cancellations will be allowed up until May 17, 2019, less $50 cancellation fee per registration. The National Court Appointed Special Advocate Association (National CASA) hosts the leading forum for best-interest advocacy in the country. This national conference brings together representatives from the organization’s nearly 950-program network, including staff, volunteers, leaders, attorneys, judges and other professionals, who are committed to promoting best-interest advocacy for the nation’s most vulnerable children. Each year, the annual conference brings together more than 1,200 people to gain valuable insights while learning about best practices, innovations and trends in the child welfare field. The expert speakers are inspiring, the sessions are educational and the participants are equipped with resources that help them further advance the organization’s mission. The 2019 conference, May 31 - June 4 at the Hyatt Regency in Atlanta, will focus on an important issue in the child welfare field: family reunification. The importance of the family in a child’s life cannot be overstated, and volunteer advocates, in making recommendations to the court, weigh that knowledge and the availability of services to support reunification against the realities of individual families’ circumstances. As a National CASA conference partner, you will have the opportunity to help further our important mission, while bringing your message to industry thought leaders, gaining brand exposure and making a positive impact on the lives of children. • It’s an opportunity to make a difference and take a leadership position on critical issues affecting children and our shared future. CasaManager is staffed by people from CASA agencies with a long standing background in working with organizations that work with the children. Community Brands is the leading provider of cloud-based software to associations, nonprofits, faith-based groups, and K-12 schools. With 2,000 employees serving over 100,000 clients in 30 countries, we help organizations grow stronger and achieve their missions. Eleo is easy to use donor (CRM) management software with all the features and integrations you need to manage your donor information in one customizable, online software. Eleo's built-in Event, Grant,Volunteer and Membership modules are all included with your monthly subscription. Eleo is designed with you in mind. It will help you cultivate stronger, more sustainable donor relationships, build long-term stewardship, and increase the return on your fundraising efforts. Eleo is affordable and secure with full live and online customer support services (included) making Eleo the right choice for your nonprofit's fundraising success. Nearly 20 years ago, we started offering integrated marketing solutions to small and mid-sized businesses across the country. But, it didn’t take long for our founder and CEO, Jay Wilkinson, to recognize that nonprofits could benefit greatly from our services. Having been active in the nonprofit community for most of his life, Jay made a steadfast commitment to help nonprofit organizations reach their goals. Now, with over 200 employees, Firespring provides nonprofits with beautifully functional websites and all the tools they need to thrive, from donation processing to social media. Each person who works at Firespring is fully dedicated not just to his or her job, but also to making the world a better place. We’re proud to say that we’re the first Certified B Corp in the state of Nebraska. We contribute significant amounts of our time, money and technology to advance important causes through personal service in our community, investments in educational programs and grants for nonprofits and the development of powerful tools that allow organizations to increase efficiency, raise more funds and build support. As a B Corp, we leverage our people, products and profit as a force for good. Nonprofits Insurance Alliance exists only to serve the charitable nonprofit community. Savings are passed on to our member nonprofits through fair and stable pricing, free and highly discounted loss control services and, when results are better than expected, through the payment of generous dividends. We now set the standard for coverages and services for the nonprofit sector in the insurance marketplace. Optima is an easy-to-use, powerful case and volunteer management software, designed by CASA experts with over four decades of real-life CASA management, technical and data security experience. We help you get things done! Optima is designed and tailored completely for the CASA life –- for your life. We know software. We know CASA. And, we truly listen and treat our customers right. This is a big triple threat to our competition and simply, advantages for your CASA program. Let’s talk how making simple steps to Optima software can help you better manage your entire CASA program. Let’s chat! In this interactive session over 1.5 days, learn from expert presenters and from your peers on topics that will improve your volunteers’ skills and knowledge in their advocacy roles. Adult-Learning Topics will include: cultural competency, core principles for a learning-centered approach, creating a safe place in the classroom and in a virtual environment for all, and running your continuing education program. No extra charge for attending this 1.5-day workshop. The State Directors Meeting is designed to build or hone executive skills among leaders in the CASA/GAL network. State leaders will increase confidence and competence with the aim of creating a highly effective culture. These interactive meetings represent an opportunity for networking, learning and sharing of ideas and best practices, and discussing challenges with peers from across the network. The Local Program Directors Meeting is designed to build or hone executive skills among leaders in the CASA/GAL network. New this year are meetings specifically for directors of local programs. State and local program leaders will increase confidence and competence with the aim of creating a highly effective culture. These interactive meetings represent an opportunity for networking, learning and sharing of ideas and best practices, and discussing challenges with peers from across the network. The 2019 Annual Conference will start with a reception, included in the cost of your conference registration. Please join us for heavy hors d'oeuvres and a cash bar to kick off this year's conference! Morning Yoga will be a “flow” class for all levels ranging from beginner to advanced. Experiencing a practice most closely aligned with Ashtanga or Hatha, participants will move through a series (vinyasas) of postures (asanas) designed to build strength and flexibility, while increasing breathing practices and calming the mind. Facilitating positive connections between foster parents and birth parents supports the engagement and participation levels of birth parents while increasing family connectedness, reducing childhood trauma and expediting permanency and the increased likelihood of reunification. In this session, you will hear from a birth parent and foster parent about how these connections, when healthy and strong, provide both children and their parents with additional supportive relationships that continue in their lives. Participants will learn about specific strategies that CASA/GAL advocates can use to further support these relationships. This workshop will feature a panel discussing the complex case issues that come up when immigration enforcement and child welfare intersect. Panelists will discuss how Immigration and Customs Enforcement (ICE) and state child welfare stakeholders can work together to ensure the safety of a child and preservation of the family unit. Panelists will guide participants through case examples to engage their participation and help them better understand these challenging situations. In this interactive session, presenters will discuss the Indian Child Welfare Act (ICWA) as best practice in strengthening families with protective factors they need to be successful. Presenters will focus on those aspects of ICWA, and the new federal regulations, that impact case plans and reunification. They will also discuss effectively engaging Tribes as partners in problem solving. Participants will be invited to engage in active problem solving and sharing their ideas. There will also be a discussion about the Texas ICWA case on appeal at the 5th Circuit Court of Appeals. Trauma Informed Care is a framework that involves understanding, recognizing, and responding to the effects of various types of trauma. Individuals who have been traumatized need targeted support and services to recover and lead meaningful and productive lives. However, those impacted by trauma are often unintentionally re-traumatized by the individuals and agencies set up to support them. Understanding the impact of trauma and re-traumatization is critical to providing the most appropriate and effective care for those who need it. This interactive workshop is designed to provide participants with a greater understanding of trauma and the steps necessary to create an organizational culture of well-being for those we serve. In this session, participants will learn about the impact of family violence including domestic violence among siblings, children’s violence toward parents and partner violence. This is a complicated issue that often has deep roots generationally. Participants will learn how families impacted by domestic violence can heal and thrive with appropriate supports and understanding providers. Using an interactive case study, participants will view child trafficking through the lens of a victim. You will understand the psychological and physical impact trafficking has on victims and the challenges in exiting. You will also develop a better understanding of the victim’s mentality and how to best support survivors. This presentation will showcase what CASA/GAL advocates can do to strengthen and support children and families impacted by poverty, substance abuse, mental health challenges, and lack of available services. Using her newly-published book, Care & Custody: A Novel of Three Children at Risk, as a case study, Gershun will address the fundamental questions at the heart of our work: What happened to put these children at risk? What services could have kept this family together? And how can we help them now? The Family First Prevention Service Act, signed into law in 2018, provides new opportunities for strengthening families impacted by substance abuse. In this session learn about key components of the law including prevention, relative placement, reducing group home placement and using evidence-based interventions. Presenters will use both personal and socio-medical framework and knowledge to share how addiction impacts the family unit. Will cover strategies that can be used to mitigate secondary trauma on the family, children and caregivers of the substance user and strategies to encourage family support and participation in recovery. This presentation aims to encourage family unification and strength, as opposed to punitive measures that are counterproductive to effective treatment. Following his presentation on "Understanding Addiction: Squirrel Logic," Dr. Lander will share strategies that help support families who are struggling with addiction from medically-assisted treatment (MAT) to other types of emotional and social supports. Following his presentation on "Understanding Addiction: Squirrel Logic," Dr. Lander will share strategies that help support families who are struggling with addiction from medically-assisted treatment (MAT) to other types of emotional and social supports.ns are one of the most important, yet largely overlooked components of a child’s foster care case. It is imperative that we work together with families and service providers to enhance parental visitations and positively impact permanence. For the child who has a parent struggling with substance abuse and living in a facility to address their addiction, visitation may be challenging for both parent and child. In this session we will discuss how to prepare children and parents for parental visitations, how to engage the family in visitation planning and how to create parenting time plans. Special consideration will be given to visits for children whose parents are struggling with addiction. This workshop will give participants the chance to learn from each other about programs and services that have proven effective in helping families and children impacted by addiction. A variety of interventions, including Family Drug Court, inpatient and outpatient treatment, and mental and behavioral health interventions for parents and children will be discussed. Bring your success stories to share and your questions for the group, to learn from best practices in other jurisdictions across the country. Safe Babies Court encourages parent engagement and provides wrap-around services to address the needs of the whole family including those struggling with addiction. This presentation will explain the importance of involving parents in this process to restore relationships and promote healthy child development, while also stopping the cycle of inter-generational trauma. General session will open with a dynamic speaker and the schedule will be updated to reflect exciting developments to our plenary speaker soon. State of CASA: Volunteer Retention and Judges Perspective Study and Brand Reveal. Affinity workshop Sessions will include workshops and networking circles, each consisting of groups with similar interests or serving communities with similar characteristics: urban, suburban, rural, or tribal. Groups will meet to learn from and network with each other. Presenters will showcase an interactive learning experience that creates empathy through the use of virtual reality. By virtually stepping into the shoes of a child, volunteers will get a glimpse of the child welfare system. In addition, participants will explore the ups and downs of the child’s life by playing a supporting board game, FosterLand™. This is a unique opportunity for those who directly support the children in our community to build a deep understanding of the child welfare system. Children in foster care are one of the most educationally at risk student groups. They are more likely to experience multiple school changes, perform below grade level, have behavior problems, need emotional support and require special education. For caregivers raising children with disabilities, it is often an overwhelming task. In addition, many older youth lack an educational decision-maker. In this session, participants will learn about an Education Decision Maker toolkit that can be used by anyone who is advocating for a child’s educational needs and services. When children’s educational needs are being met and they are successful in school, it has a profound impact on their overall well-being and stability. This session will provide CASA staff and volunteers with effective methods of engaging the greater community to help provide material and emergency assistance to children, families and older youth they are working with. Presenters will provide examples of social media pleas, grant requests and agency processes. Research shows that the outcomes for children who live with relatives are more positive than if they live with non-relative foster care parents. The vast majority of these relatives are grandparents. Grandparents caring for grandchildren often face greater health, mental health, social and financial challenges than those in the general population. Hear from two grandparents who are raising/have raised grandchildren. They will describe the supports that were helpful, the barriers they faced and how CASAs can support children placed with relatives. Young people in foster care need opportunities and supports to establish long-term networks of people and resources to carry them through and beyond foster care. Learn from alumni of care how CASAs can support this by advocating for participation in normal childhood and teenage activities and experiences. CASAs have a key role in fortifying young people's existing relationships in family settings, schools, job placements, and the community, while building an enhanced network of supportive connections both in and after care. The CASA Project of Worcester County launched a program last year to strengthen children and families, specifically regarding barriers to mental health services for children and youth in need of them. In this session learn how the program has worked with community agencies and partners to provide immediate access to trauma-based therapy; increase the number of culturally-competent clinicians to respond to the unmet need of effective mental health services and mitigated transportation issues, reducing no-show rates for children in care for these important appointments. Learn how to work with caregivers, including relative providers, who struggle with managing the mental health challenges and trauma experiences the children they care for, often face. Have you ever wondered why some children and caregiver’s behavior seems so bizarre? Information will be shared on the impact of trauma on children and caregiver’s behavior, brain development, changes in brain chemistry and the long-term effects on neural connections as well as physiological responses in children and caregivers who have experienced trauma. Participants will be energized with new ideas and actionable steps to effectively engage children and their families. Part II will occur in session F.
Learn how to leverage social media as an effective way to tell your story and as a call to action tool to drive potential volunteers to your website. Go behind the scenes in an exclusive tour with the director, and a CASA volunteer, about the making of the campaign. Learn how National CASA Association will execute the campaign nationally on social media, in cinemas and on national broadcast outlets. Have you ever wondered why some children and caregiver’s behavior seems so bizarre? Information will be shared on the impact of trauma on children and caregiver’s behavior, brain development, changes in brain chemistry and the long-term effects on neural connections as well as physiological responses in children and caregivers who have experienced trauma. Participants will be energized with new ideas and actionable steps to effectively engage children and their families. This is a two part session and part I was during session E .
This celebratory dinner is included in the cost of your conference registration. The event will include dinner and an awards ceremony to honor our dedicated advocates, judges, board members and staff, with music and dancing to follow. If you would like to invite a guest to attend the event with you and they are not a conference registrant, you'll have the opportunity to let us know later in the registration process. Incarcerated parents are often overlooked by courts, child welfare agencies, and advocates when it comes to reunification services. This applies especially to parenting time and contact between the child and an incarcerated parent. Yet the great weight of evidence demonstrates that meaningful and regular contact - especially visits - between the child and an incarcerated parent is important to the well-being both of the child and of the parent. The presentation discusses this evidence as well as strategies for improving outcomes in cases with an incarcerated parent. Learn from local experts regarding the importance of using a multi-disciplinary team approach when working with victims and survivors of child trafficking. Learn about the key players with whom you can collaborate to strengthen the community response to child trafficking. Also, the different specialized teams that exist in your community and what expertise they might bring to help develop a more comprehensive approach to addressing child trafficking. Executive functioning and life skills are important elements of any adolescent's life that can be disrupted by the presence of Adverse Childhood Experiences (ACEs). By focusing on building trusting relationships, expanding executive functioning, and teaching positive life skills through the informed lens during the adolescent period of development, successful, productive adulthood can be achieved. Youth involved with child welfare are at greater risk of becoming involved in the juvenile justice system when compared to their peers not in foster care. Being in foster care increases their vulnerability to many situations that are often times beyond their control. This session will discuss: Why that increased risk level exists; strategies that CASAs can employ to better support their youth on a personal level to reduce their risk of crossing over into juvenile justice; and, ways to increase advocacy for youth on a systems level. In this presentation, learn child friendly policies that allow children to maintain their parental relationships while reducing face to face visitation in prison. Some of the effective strategies include referral processes for children in a caseload that have a parent incarcerated, computer mediated visit process with the jail and child welfare system, screening tool for determining best interests of child regarding visits with parent in jail, and follow up mental health support for child after visit. Networking Circles are small groups with similar interests and/or with shared goals who meet to learn and grow together. Come join others to discuss the like issues programs are currently facing and share about what is working for you. Joining a Networking Circle will give you the support to evolve in your areas of mutual interest. Attendees are taking on new challenges and opportunities thanks to the encouragement of Networking Circles.